Aromas are the essential part of the olfactory tasting, the "nose" of the wine. But aromas also play an essential role in the tasting, the "mouth" of the wine. In short: the glossary that you can use to describe your tasting sensations. How to smell the different aromas in the wine? The eye, the nose, the mouth, the three stages of tasting each correspond to the use of one of our senses. But make no mistake, during the tasting, it is by far our olfactory organ that is most in demand! Our olfactory bulb is of course used to perceive the aromas of the wine when we study its nose, but it is also stimulated to perceive the aromas of the wine when we have it in our mouth. Indeed, the tongue can only distinguish 5 flavours: salty, sweet, bitter, sour and umami. And it is thanks to the famous feedback that the aromas of the mouth are "raised" to the maximum towards the olfactory bulb. We strongly advise you to practice feedback, the change in perception is immediate and you will feel more aromas and this more strongly. Where do the aromas of wine come from? The aromas you smell come from three characteristics/stages of the wine's life: the grape variety, fermentation and ageing. Just as there are several varieties of apples, each with very different taste characteristics (such as Granny, Golden, Pink Lady, etc. ), there are many varieties of grapes, called "grape varieties". Each grape variety (Muscat, Chardonnay or Riesling) also has its own characteristics, particularly aromatic. For example, Gewurtztraminer, a highly aromatic grape variety, will be renowned for its rose and lychee aromas. On the other hand, other grape varieties, such as Riesling or Chardonnay, are less aromatic and different terroirs will give distinct aromatic expressions. The trick: often, the aromas of fresh fruit are directly the expression of the grape variety and are therefore considered as primary aromas. The fermentation process is quite complex and we will not go into details today. 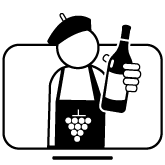 In short, fermentation is the process of changing from "grape juice" to "wine" by transforming sugar into alcohol using yeast. Of course, fermentation is a much more complex reaction than it seems and aromatic molecules evolve at this stage. The choice of yeasts is fundamental to the development of certain specific flavours. Remember the Beaujolais nouveau banana, it was a specially selected yeast that was responsible for this particular taste! As you might expect, the development of the wine's aromas does not stop once the fermentation is complete. Otherwise, what's the point of aging him? Both during ageing (in oak barrels for example) and then during ageing in bottles, new aromas will appear (beeswax for white wines for example, mushrooms in the case of red wines, etc.). 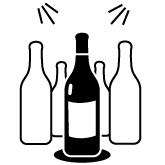 Very fine wines can improve with age and develop a very complex range of aromas. But be careful, each wine has a shelf life and the vast majority of wines will be drunk within five years of harvesting. The world of wine aromas is very rich and complex. To recognize these aromas more easily, first look for the "family" to which they belong (is it a flower, a red fruit...). Blind tasting tip: Gewurtztraminer is characterised by its pronounced rose aromas. The woody aromas are more or less noble (wood chips "woody" the wine without much nuance...). The "cedar" aromas are the hallmark of some of Bordeaux's great wines. As the name suggests, fermentation aromas are secondary aromas, directly related to fermentation. The great white wines of Burgundy, which ferment in whole or in part in barrels, are typically marked by buttery, brioche aromas. These unruly aromas are usually associated with wine defects.